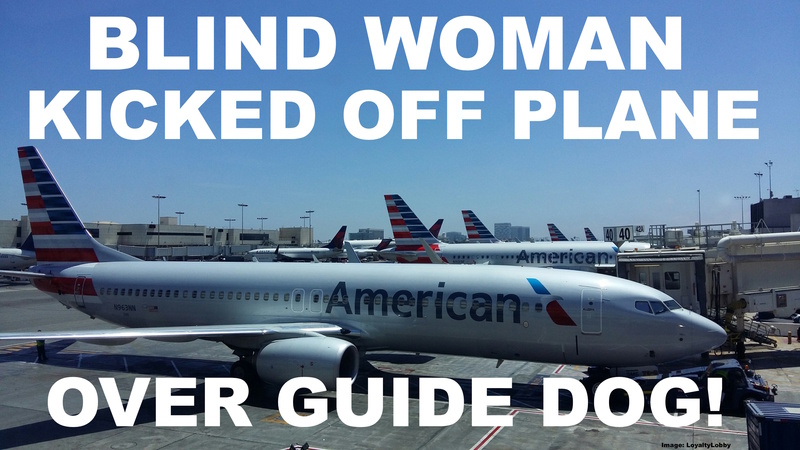 American Airlines “brilliant” customer service came to shine again when a flight crew had a 61 year old blind woman removed from the plane after issues developed over accommodation of her guide dog. Apparently ground agents didn’t assign the lady a seat that would easily accommodate the dog which led to issues once they got on board. A situation in First Class where another passenger wanted to swap seats with the senior then escalated (in typical AA fashion) to the woman being kicked off the flight on the cabin crews request and pilots authorization. There was an article about this in the Dallas Morning News (see here) which I saw in my social media feed this morning. A blind woman says she and her guide dog were removed from an American Airlines flight this month after she asked for a new seat. Sue Martin, who is blind, was booked on a connecting flight from Washington, D.C., to DFW International Airport on March 1. When she boarded, the 61-year-old realized her dog, a German shepherd named Quan, wouldn’t fit in the row to which she’d been assigned. “There was not enough room for a 75-pound dog and three adult humans,” said Martin, a Maine resident who was traveling to San Diego with her husband. Martin said she asked to be moved to a row with more floor space for Quan, but a flight attendant told her to speak with an agent in the airport. That agent told her she could not move to another row, Martin said, or sit in first class, saying it was against airline regulations for a service dog to be in first class. Martin returned to the plane, and a man in first class offered to switch seats with her. After she accepted and sat down, another American employee got on and asked her to leave the plane, she said. On the jetway, the employee told Martin her ” ‘presence on the plane is not safe,’ or some stupid thing,” she told the Press Herald. Her husband asked the pilot why he had asked for their removal, she said. “Because I can,” he reportedly said. This is a ridiculous response from the flight crew and it makes me wonder at the same time why no provisions have been made ahead of boarding time to accommodate a person with a seeing eye dog at a proper space. It’s very common that German Shepherds are used as service animals and those are obviously much bigger breed than your average dog at home, unlikely to just fit under a seat. At the same time the lady was traveling with her husband so I wonder if the dog could just have laid in front of their two seats but who knows. I looked through American Airlines website for the transportation guidelines of service animals (see here) and pets (see here) and couldn’t any outlined regulation that says service animals aren’t permitted in First Class which leads me to assume this was just something the Flight Attendant made up in that moment. Not sure if such a rule would even be legal in the U.S. to begin with given the stringent regulations of the ADA governing the handling of disabled passengers. If you have a really large guide dog (75 pounds isn’t huge for a German Shepherd though) then it would probably be recommended to advise an agent at check-in or at the gate about these seating requirements and not do this during the boarding process. They knew they have a dog, they knew Economy Class isn’t exactly the epitome of spacious luxury so why wait this long? Even though the lady wasn’t entitled to a First Class upgrade a passenger decided to offer her a seat and move to Economy yet the crew intervened again and decided to kick her off the flight. The response of the captain was completely unprofessional. I’m confident the lady complained through the appropriate channels including the Department of Transportation.